Last night Lovell and I got in an 1850 point round of 40k, Kingbreakers versus Necrons, straight up basic Annihilation. I think this was the first game I’ve won against Necrons since the new book came out, and it was looking iffy until somewhere around turn five of a six turn game. Notably to that end, he was not using the Decurion formation (and its global 4+ Feel No Pain); I believe it does not permit him his beloved Destroyers. The Kingbreakers’ First Squad burst from their Drop Pod even before it hit the ground, running as one toward their objective. Flamers swept away a pack of zombie cultists without pause. 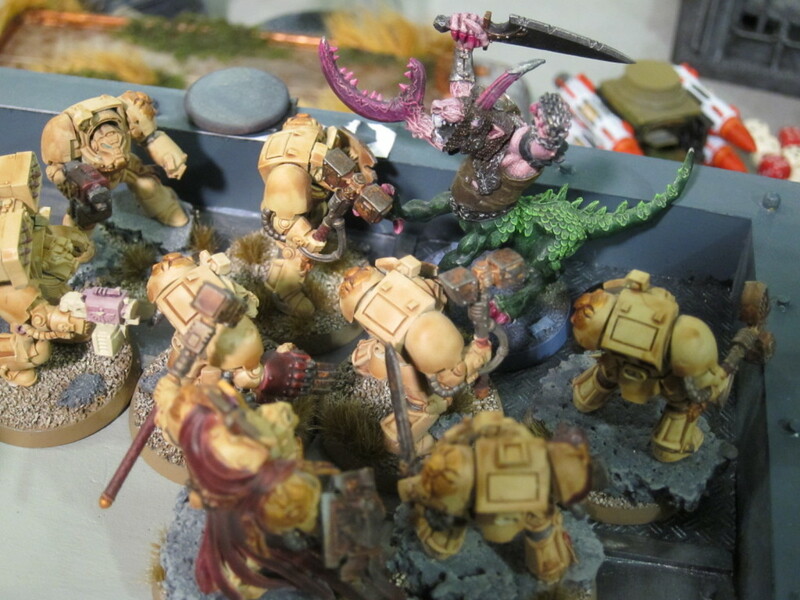 Sergeant Scolirus’ powerfist dispatched an intercepting greater daemon on the fly, preserving momentum. The battle brothers each felt the tingling energy crackle as they breached the overlapping void shields but none had a moment to reflect on it. Their target in sight, Captain Angholan jumped in a single bound to the top of the shield generators, ran across the battlements, and leapt into space, hurling an ancient Vortex Grenade into the smoking maw of the corrupted Warhound directly in front of them. At this range the wildly unpredictable warp attack might prove as deadly to themselves as the traitor Titan itself. But none would ever be able to say they had not given everything for the Emperor that had saved them. 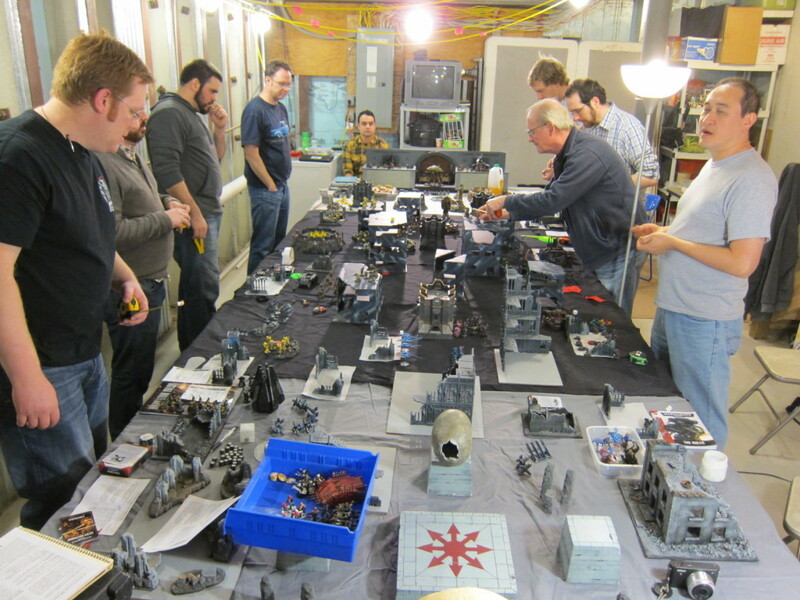 This past weekend the Philadelphia Area Gaming Enthusiasts (PAGE) crew held its roughly annual major Apocalypse match. 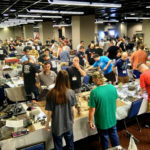 The event was expanded this year to two days: One of Recon Squad skirmishes and a Cataclysm mini-mega battle, and another day of full-on Apocalypse battle royale. Sixteen players participated, with 24,000 points per side in the finale. Apocalypse: The Fall of Kimball Prime! A full report of the campaign follows below. Campaign map from the 2010 Combat Patrol League. 2009 (Apocalypse): Chaos invades the planet of Caldor IV for reasons unknown but is eventually ground to a bloody stalemate. 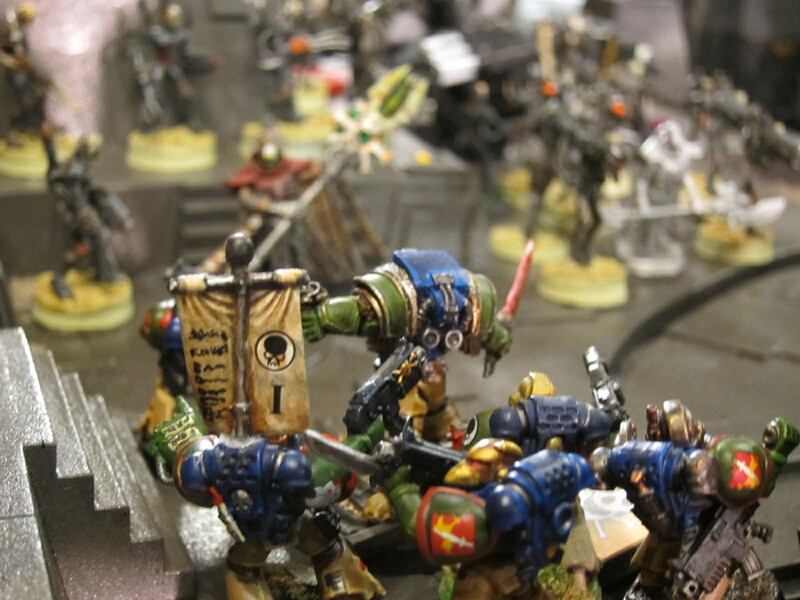 2010 (Combat Patrol league): Expeditionary forces begin searching Caldor IV for rumored relics. 2010 (Apocalypse): Fighting spreads throughout the system as Chaos crushes Rittenhouse Hive. 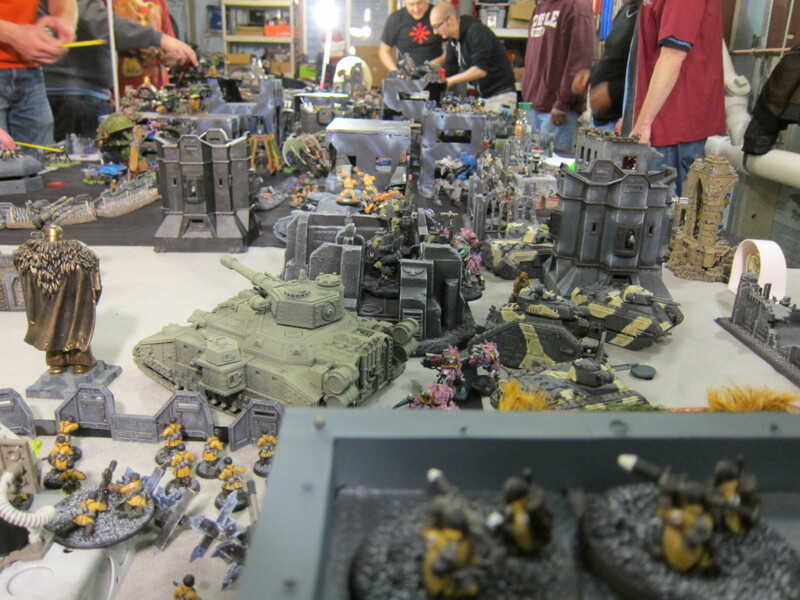 2012 (Apocalypse): An Ork incursion onto their flanks is fought off by the Chaos forces. 2014 (Apocalypse): Imperials fight back and begin to turn the tide, making a successful stand on Kimball Prime despite a newly forged alliance between Chaos and Maynarkh Dynasty Necrons awoken by the conflict. 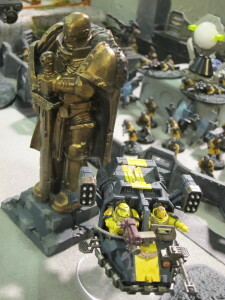 2014 (Campaign Tournament): Imperials rescue Magos Ferdinand from hiding on Caldor IV and declare the planet Exterminatus, cutting their losses. 2014 (Recon Squad + Cataclysm Campaign): Chaos retrieves The Scythe of Unbound Light, a long lost great weapon, even as the planet begins to crack. The entire weekend was fought over a single board, representing the main gate to the major Manufacturom on Kimball Prime (the venue, my house, being on Kimball St and my painting log being the Kimball Prime Manufactorum Log). 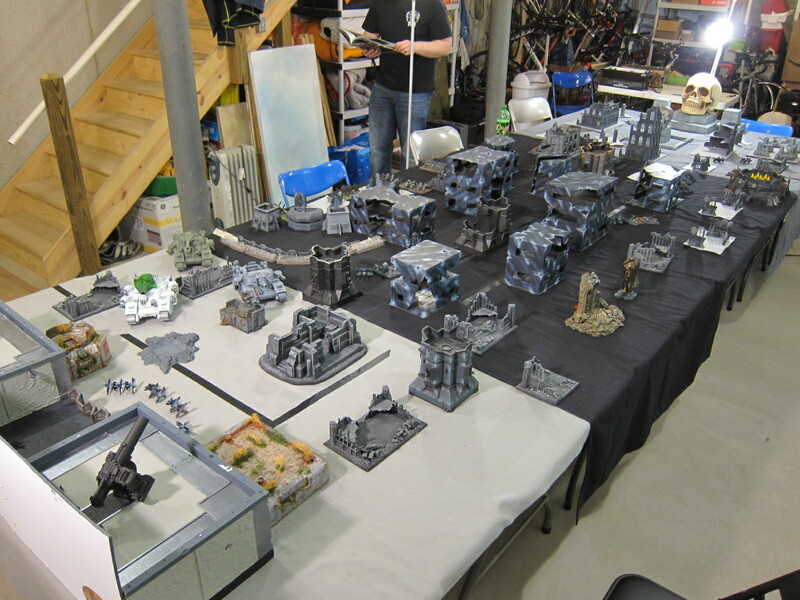 Though we’ve previously done well at building good Apocalypse boards, this year a bunch of people built even more terrain so we’d have a single unified look. 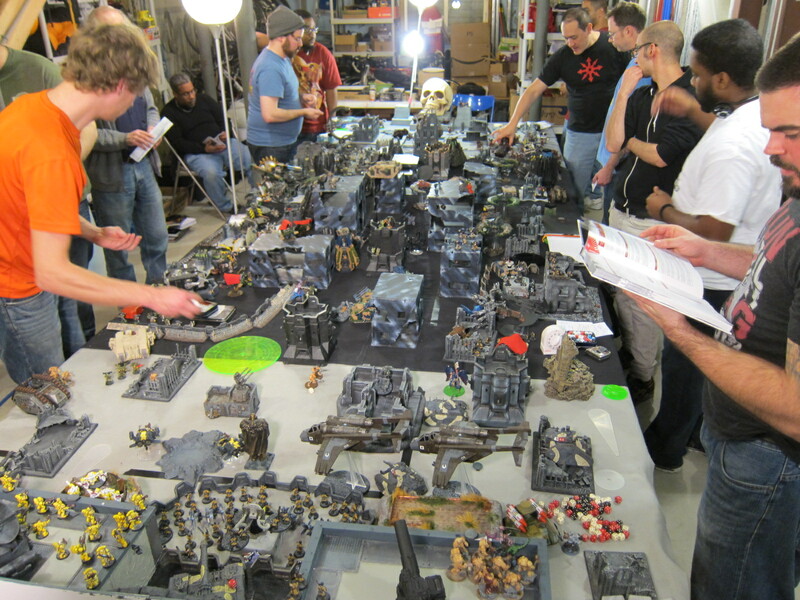 The table was just over 6′ by 17′ long, following our usual calculations on sizing multiplayer and mega-battle tables. Apocalypse deployment zones were L-shapes, with the teams taking one short edge and all but 4′ of their respective long edges, creating a 2′ strip of S-shaped no-man’s land. 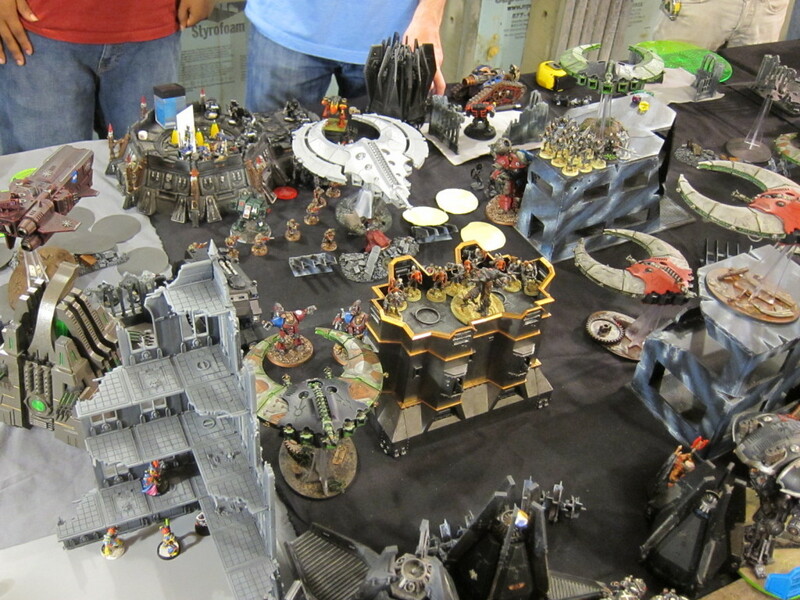 At one end was the parade ground and main gate fortress of the Kimball Prime Manufactorum, built for a display board at this year’s NOVA Team Trios Tournament. 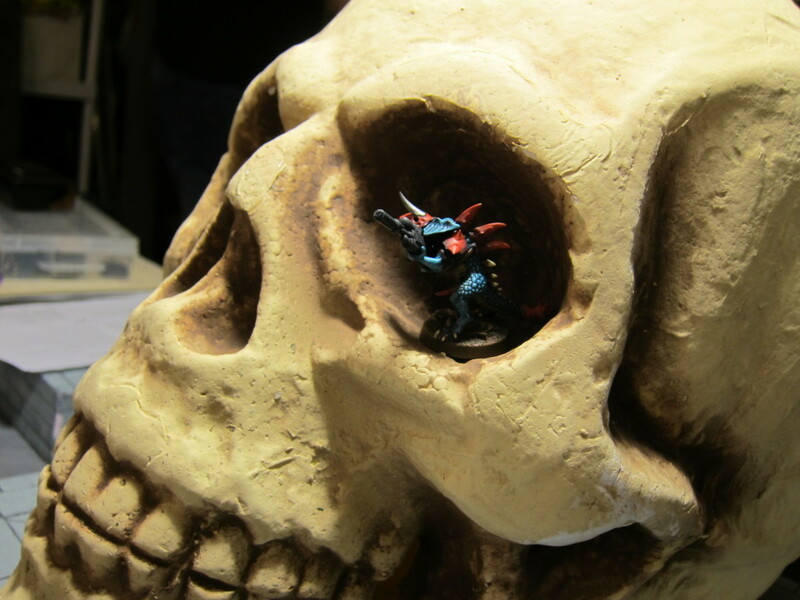 The other end was anchored by a series of giant skulls emplaced on Chaos temples, representing The Scythe of Unbound Light. Both were essentially played as Aquila Strongpoints with Macro-cannons, the fortress actually being two strongpoints but one cannon, and The Scythe having two annexes. These were blended into an urban core in the middle, with the ruins progressively more dense toward the center. 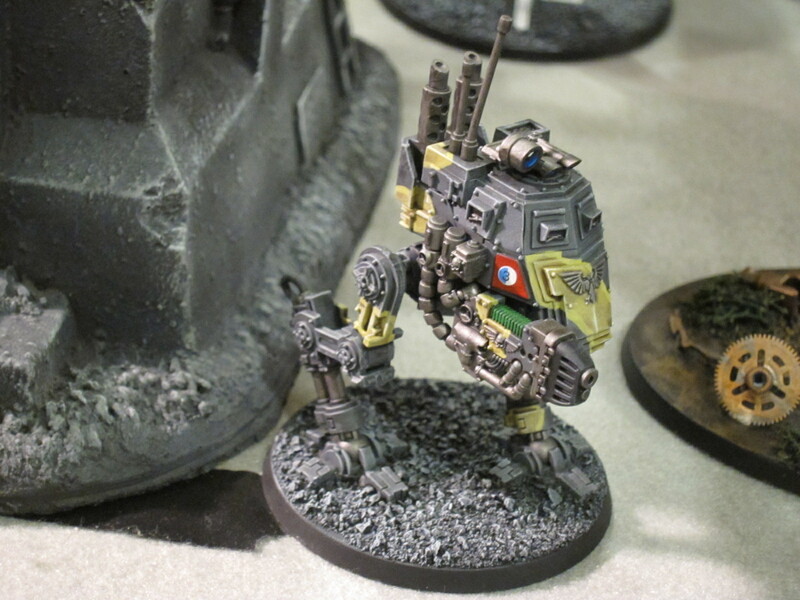 Between and among all this both sides deployed defensive constructs, with Discord’s Iron Warriors in particular laying down extensive siege works. The field of battle prepped and ready. 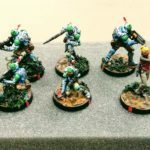 The first part of the campaign used our Recon Squad rules for 200 pt skirmishes. These are very similar to the traditional GW Kill Team variant, but with tighter rules and better adaptations to 7th edition. 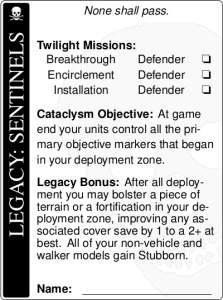 Around these we used our Twilight on Caldor IV campaign mechanics, in which each player picks a legacy like Bodyguards, Sentinels, Headhunters, or Scouts from eight options, and tries to achieve that legacy through winning several specific scenarios from eight missions like Assassination, Installation, Excavation, or Breakthrough. The main table was divided up with twine into four 4×4 Recon Squad boards, with two more side boards assembled for fighting at the poles and in the swamps of Kimball Prime. 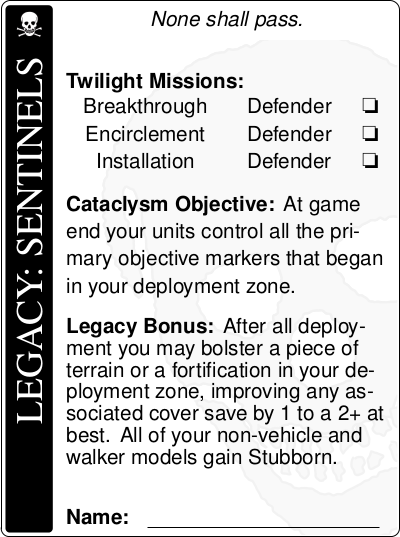 Legacy card for the Sentinels. 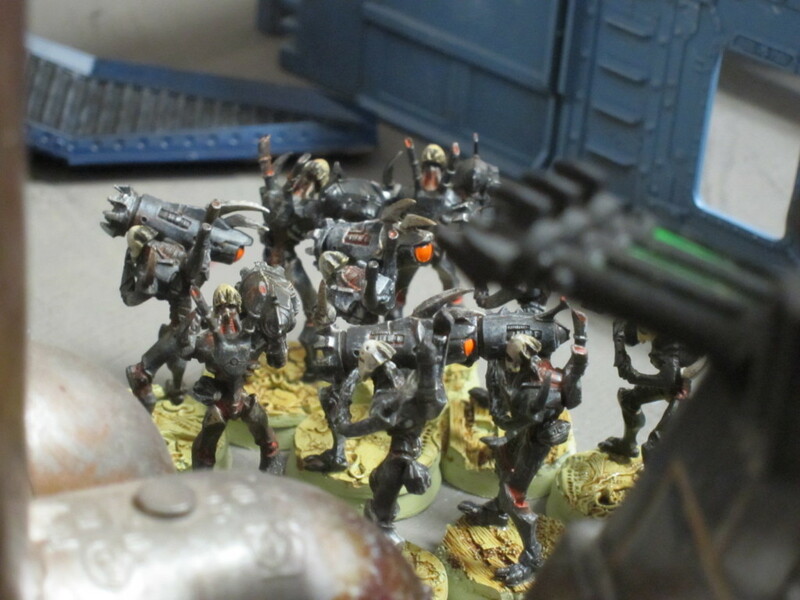 A pack of Screamers dominated their matches, helping the Legions of Discord to a healthy 116 to 83 victory in the vanguard battles of the imminent Apocalypse. In a key moment, however, a squad of The Fallen were run to ground in a ruined Imperial chapel, yielding the first hints of the greater forces at work behind the scenes. Brother Teleos stepped carefully among the rubble, futilely trying to avoid crunching in the loose debris. The shadowy figures had clearly retreated into these chapel ruins once the cultists they’d been using as meat shields had been pulped. At the distinctive boom of a bolter firing behind him, instinct spun Teleos around instantly even as another part of his mind registered that it was too late already. It took a moment then to process that he was still functioning, and then another to fully register the robed, power armored figure falling to the ground mere feet away, a long monoblade raised toward him. Framed in the archway beyond stood Ghost Sergeant Harmon. The black clad Kingbreaker gave Teleos the sign for eyes-up before silently stalking on deeper into the chapel. 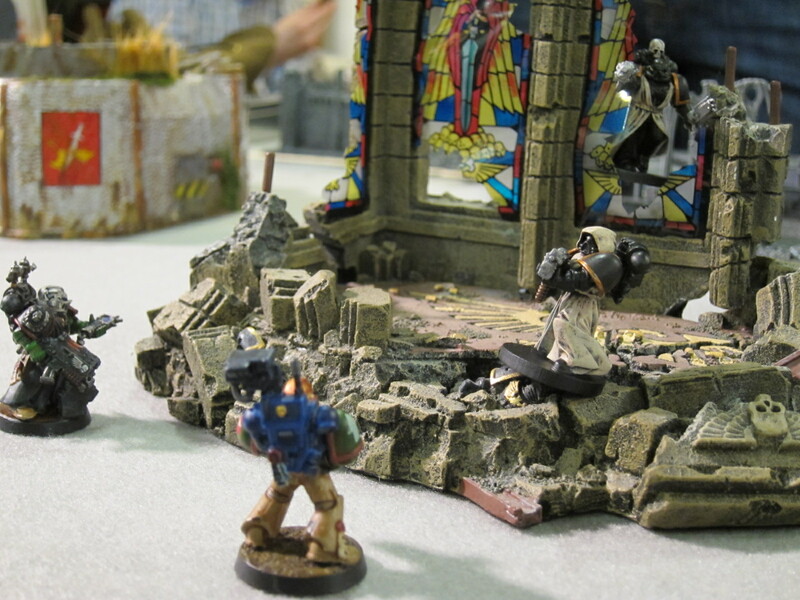 Fallen and Kingbreakers have a standoff in a ruined Imperial chapel. In the next part the Recon Squads gained 300 points of reinforcements and piled into a single Cataclysm battle over half the main board. 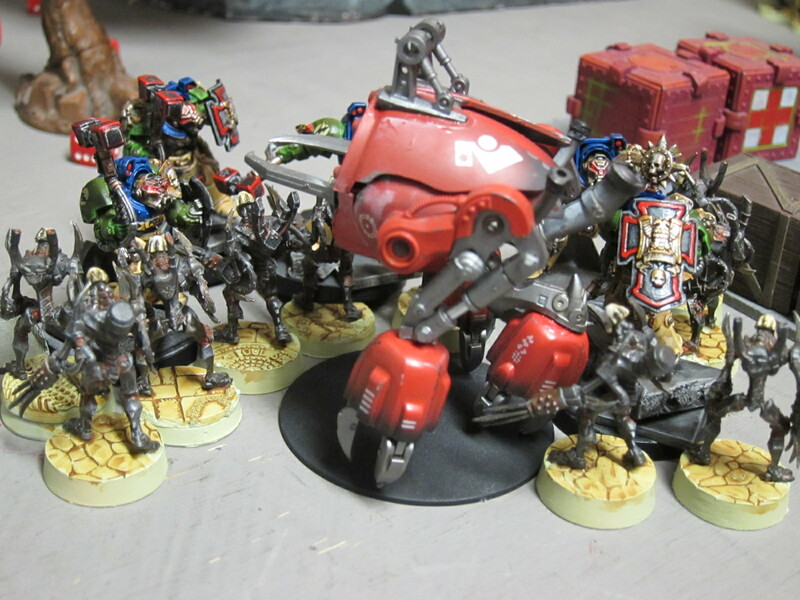 On the edges of the parade grounds a seesawing conflict was fought between Mechanicum automata and Chaos Cultists joined by summoned daemons. Across the battlefield, an isolated band of Imperial Fists were rolled off the flanks of the temple grounds by daemons and traitor Marines. 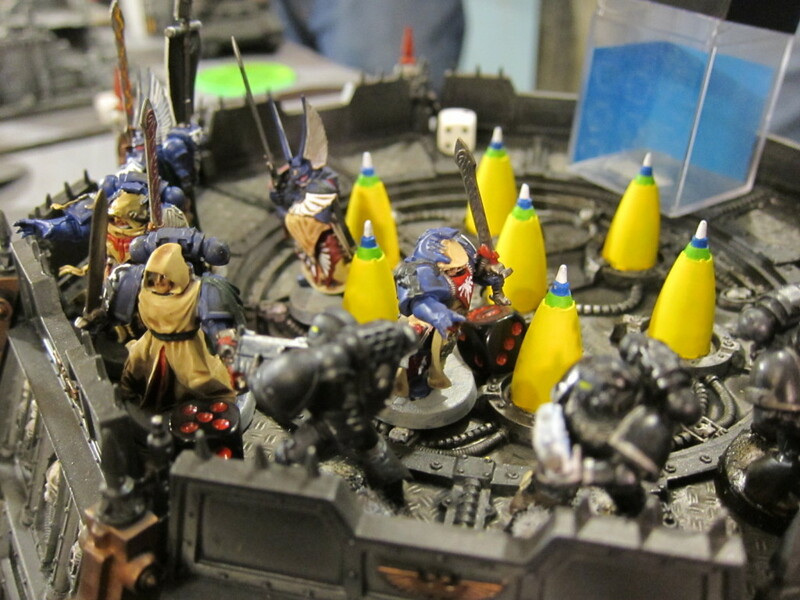 Coming to reinforce the position, Clan Raukaan troops found themselves ambushed by Night Lords. Despite a steady armored push up the center of the battle, Major Zdarsky’s 59th Armageddon crashed onto the enemy objectives too late to swing the Imperials’ fortunes. By the end both warmasters were slain but Discord continued its successes, holding the majority of the six primary objectives in scoring rounds after Turns 2, 4, and 6 to earn 20 points to Order’s 14, both having also assassinated several opposing warlords. Squads on both teams squads secured their legacies, with the daemons’ Penetrators claiming an Order objective and the Kingbreakers’ Bodyguards successfully executing a flying block for Major Zdarsky and his armored column. 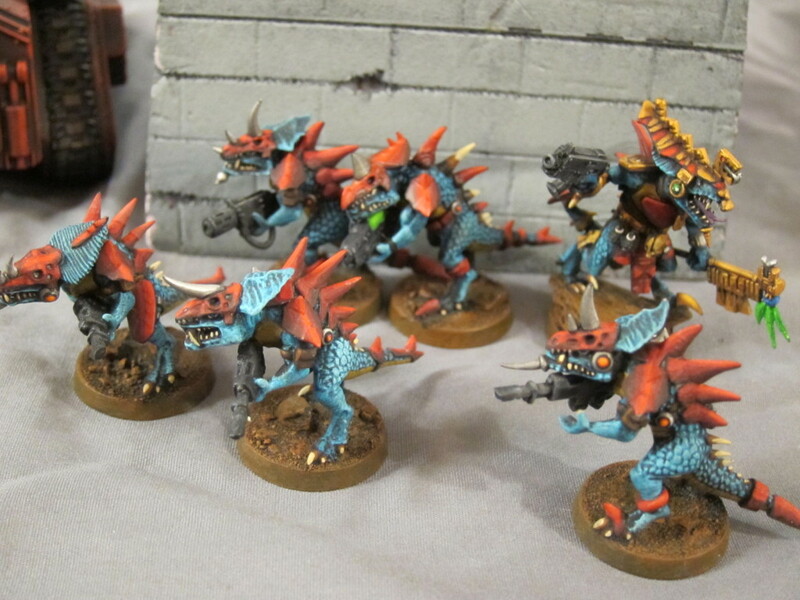 Lizardmen fight against the Imperium that would scorn them. Night Lords stalk the shadowed alleys and ruins. The next day the conflict at the Manufactorum gates expanded again. Companies of Space Marines, packs of Cultists and Daemons, Mechanicus war engines, and all manner of armies descended on the battlefield. A newly arisen Necron Citadel. After all deployment was complete, each player additionally placed a secondary objective anywhere 12″ from table edges and other objectives. Scoring was held after turns 2, 4, and 5 (game end). Primary objectives could only be scored by troops in the mid-game rounds. All troops had Objective Secured regardless of detachment structure. Primaries were each worth the current turn number. Secondaries were worth one point each. Warlords, superheavies, gargantuan creatures, and mighty bulwarks were additionally worth a point each, with an additional point for slaying the designated warmaster (chief warlord). Having handily won the preceding day, Discord took the prerogative of choosing to deploy and play first or second and chose second. They also got a free Macro-Cannon on The Scythe for their successes throughout the campaigns. Each team took up to 30 minutes to deploy, with Seize the Initiative unavailable. 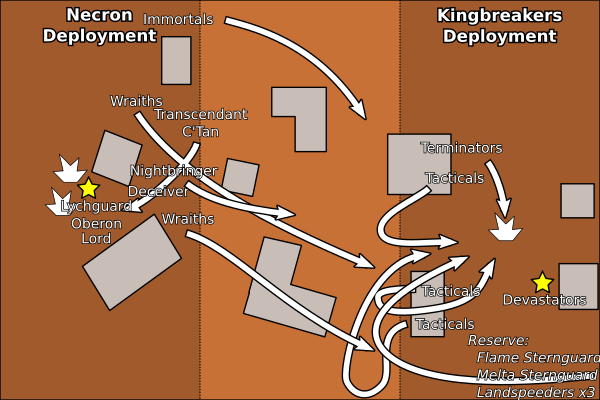 Modified Apocalyptic Reserves were applied, with a schedule of earliest arrival based on maximum unit movement speed. Each turn the commander for each team could designate one unit to make an All Out Attack, advancing at triple its movement but foregoing shooting/running/moving flat out. Both commanders also selected eight Strategic Asset cards to be given to their warlords in need throughout the match. 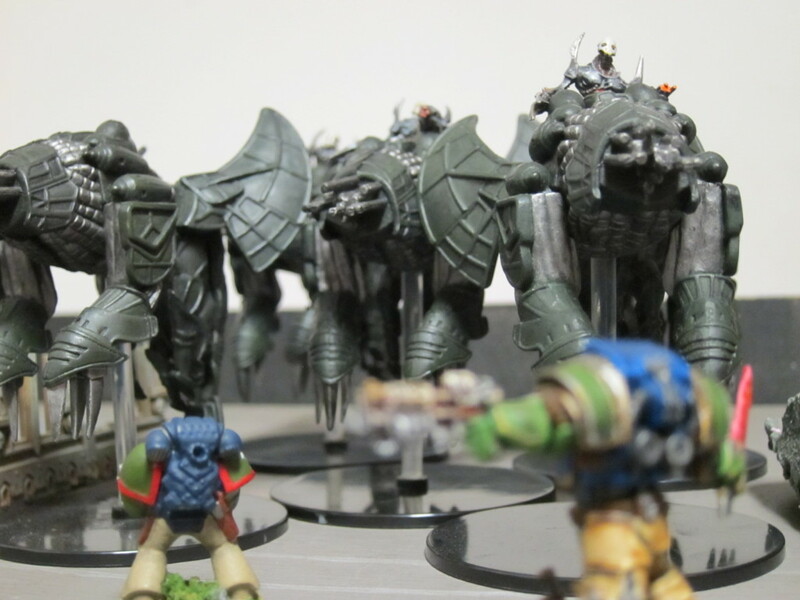 The Sentinels of Terra and the 59th Armageddon await the onslaught. The Forces of Order had a nearly decisive first turn, inflicting major losses. 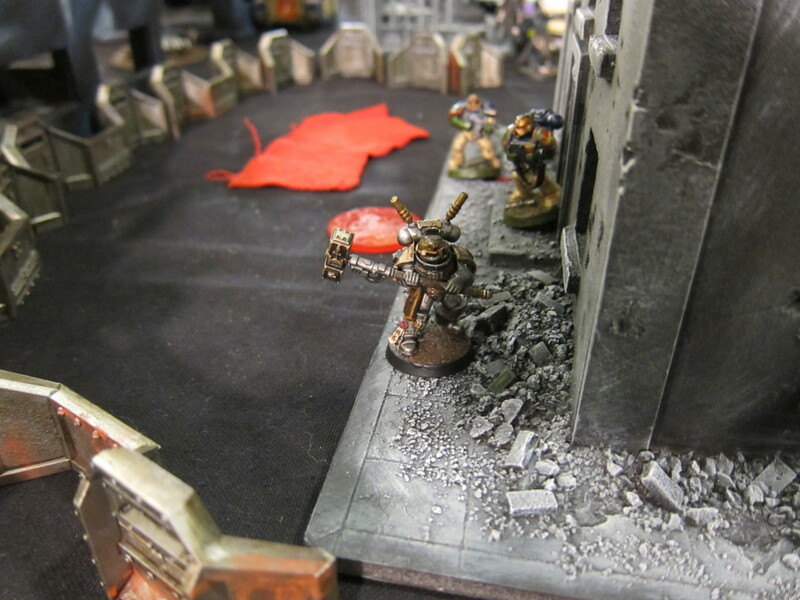 The Kingbreakers’ Librarius of Rorschach make a suicidal Drop Pod strike into the heart of the enemy deployment zone. Binding their psychic potential together, they cast a massive Warp Vortex directly on top of a corrupted Hellhammer, blasting it immediately into the Immaterium. 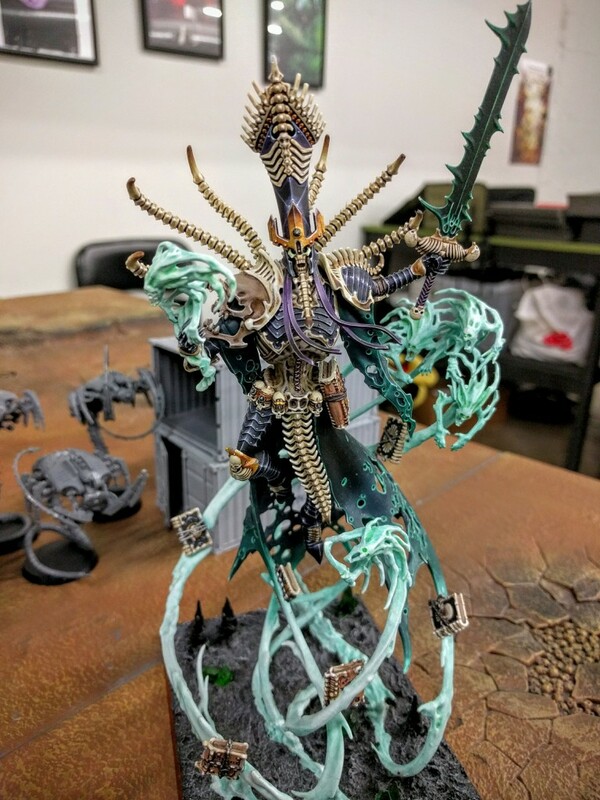 Though the entirety of the Librarius gave their lives for the action, their angry spirits lived on in the vortex they’d spawned, sucking a number of Greater Daemons back into the Warp throughout the battle. 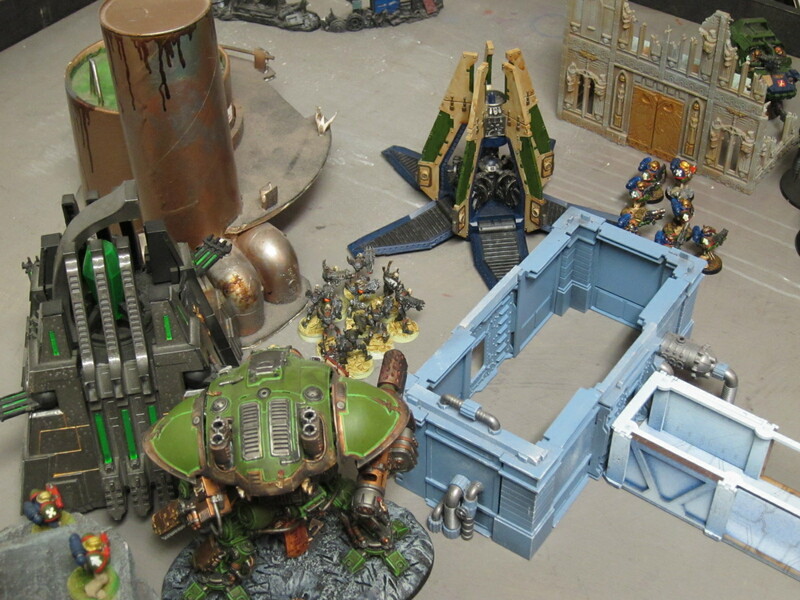 Nearby, punishing bombardment from the 59th Armageddon and a contingent of the Sentinels of Terra on the parapets of the main gate fortress obliterated a Void Shield Generator and a corrupted Baneblade on the leading edge of the Discord siege works. 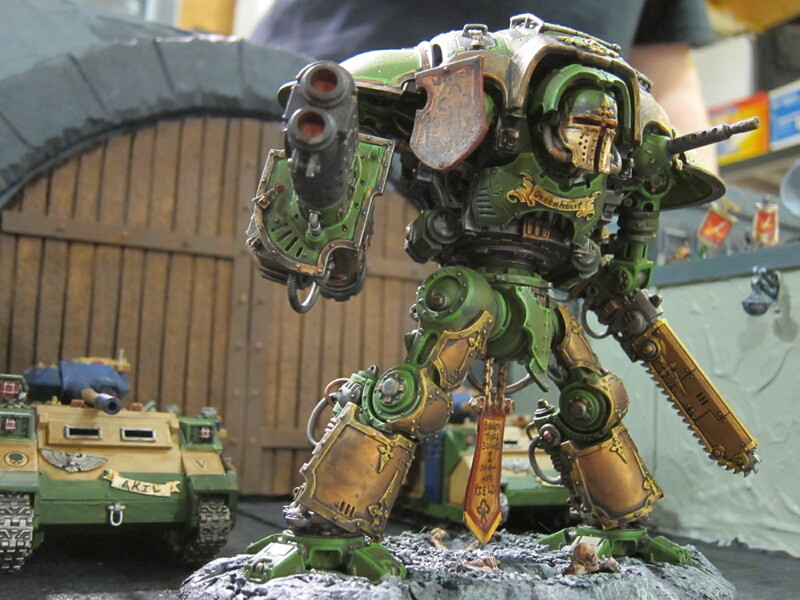 Covered by the withering hail of fire, the Knight Errant Greenheart simultaneously charged across the battlefield and plowed through the zombie cultists futilely blocking its way, stomping through their lines and crushing the other Void Shield Generator guarding the Discord siege headquarters. At the far end of the battlefield, Clan Raukaan Centurions and Sternguard made a mass drop on the Necron Citadel and astoundingly earned a critical first turn kill of the emerging Transcendant C’Tan before it could wreak havoc. 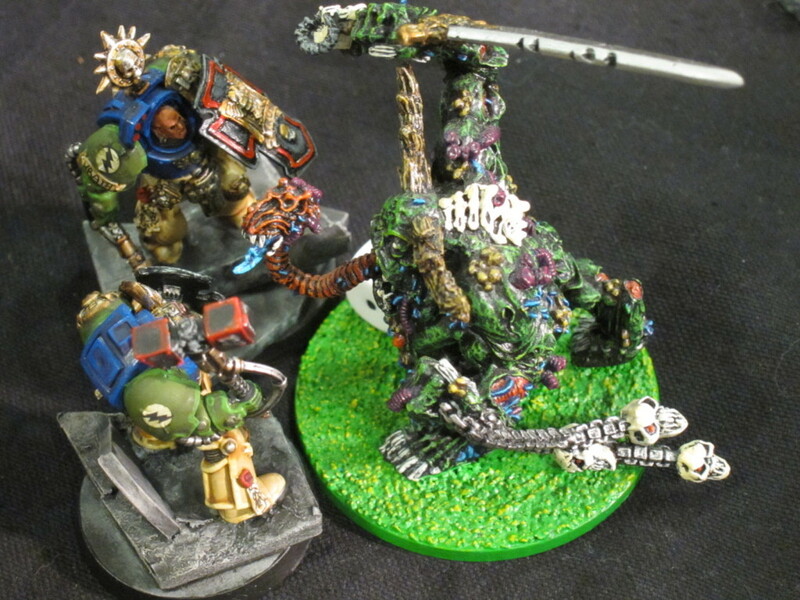 A Great Unclean One exchanges mighty blows with a Terminator Sergeant. Reeling from these blows, the Legions of Discord worked grimly to pull their battle plan back together. Four greater Daemons bound together in a Tetragon of Darkness shrouded the Chaos troops in protective wards from the enemies now running amok among their lines, while the nanites and scarabs of the Necron Citadel did the same for the automatons. A massive blind barrage shielded the advance of hordes of Lizardmen, Night Lords, and other traitors in the shadows of a many-legged Greater Brass Scorpion toward the Mechanicum’s Aquila Strongpoint. 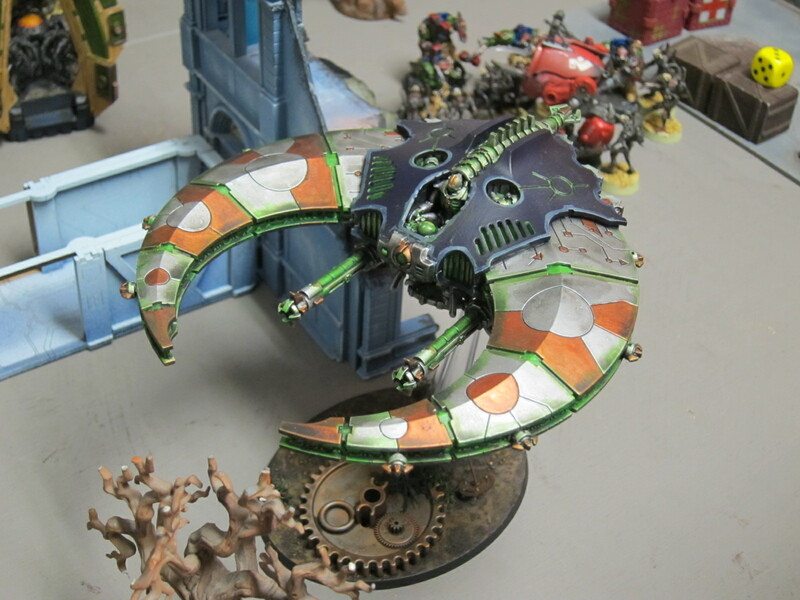 One of Ahriman’s Covens sacrificed itself en masse ahead of the group to spawn a bevy of warp rift vortexes that would plague the soldiers of Mars for the entire battle. Responding in kind, a Dark Angels Librarius began tearing at reality ahead of the oncoming army. Together the two bands of psykers turned that entire quadrant of the battlefield into a crazed, unpredictable nightmare where instant death might come at any moment, no matter how brave the warrior or thick the armor. A Dark Angels Librarius recklessly tears rifts in reality all about the incoming Chaos Marines from their Aquila Strongpoint. 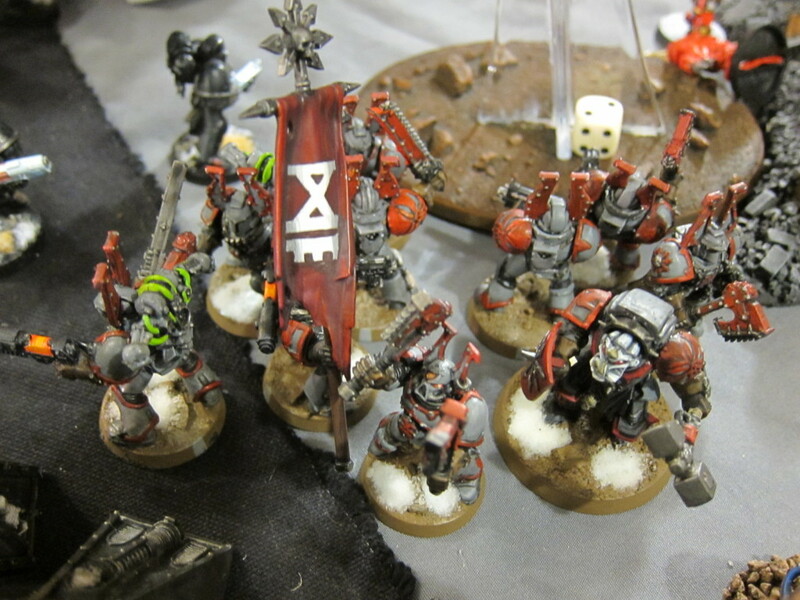 A band of Chaos Marines marches toward the Mechanicum’s Strongpoint. With little left in reserve following the punishing first round strike, the Forces of Order were stretched thin to cope with seemingly endless Discord reinforcements and slowly the momentum shifted. 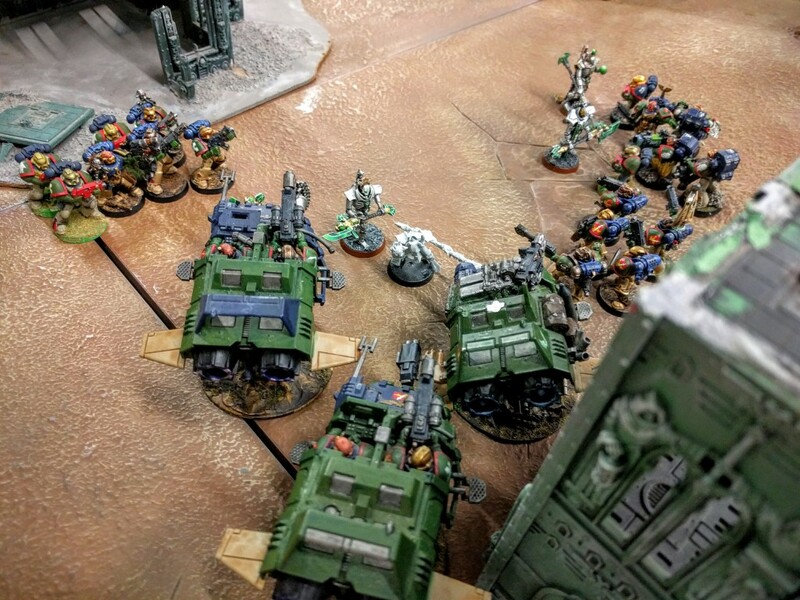 Deep in the Discord lines, isolated bands of Kingbreakers, Dark Angels, and Raukaan fought brave tactical battles to claim important ground, but were repeatedly swept away by outnumbering opponents: Once the Siege HQ was threatened by Order forces, Land Raiders full of Chaos troops appeared to fight them back. With the Necron Citadel about to be overrun by combined arms, a large band of Cultists arrived to hold it until the Maynarkh could regroup. Again and again the story repeated, snatching victory from the loyalists. On the Imperial side, wave after wave of Necron flyers harrassed the Mechanicum position. 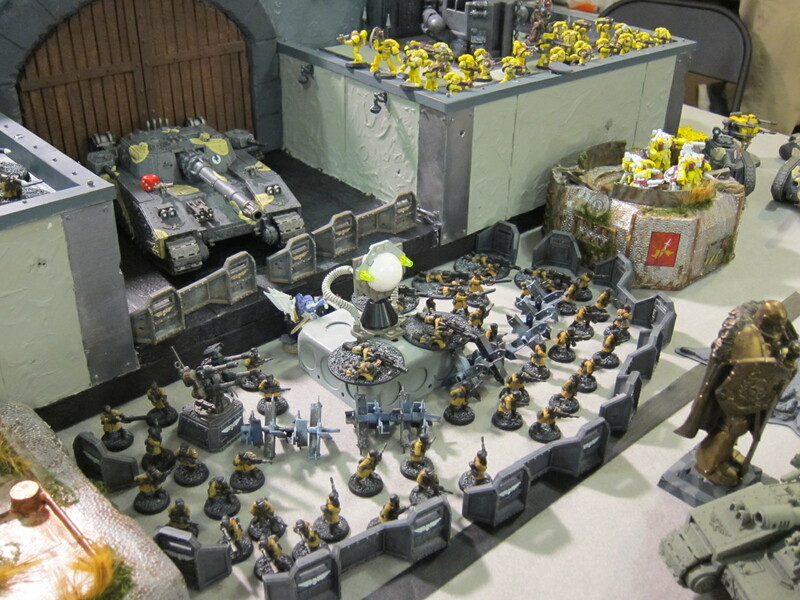 Though many Tech Thralls and reinforcing Raukaan gave their lives to shore up the Strongpoint and the Greater Brass Scorpion was eventually brought down, the redoubt was inevitably overcome in a flood of Chaos Marines. Deathwing drag down a daemon spawned on the parapets of the main gate fortress. Most devastatingly, late in the battle several small squads of Chaos space marines outflanked onto the Imperials’ position around the shrine dormitories. Having already repelled a large attack of Soulgrinders, lesser daemons, and zombies, the position had been thought secure. Heavy shelling from the 59th Armageddon combined with sustained fire and assaults from the Kingbreakers and allies eventually cleared the position, but the damage had been done. Stretched thin across the multiple objectives in the area, there wasn’t enough time for Order forces to shore up the position before a final, desperate, high speed strafing run of an entire squadron of Necron Doom Scythes managed to wipe the defenders off the primary objective in the closing moments of the battle. Inquisitor Hersch and Kingbreakers Tacticals investigate noises in the alleys around the shrine dormitory. 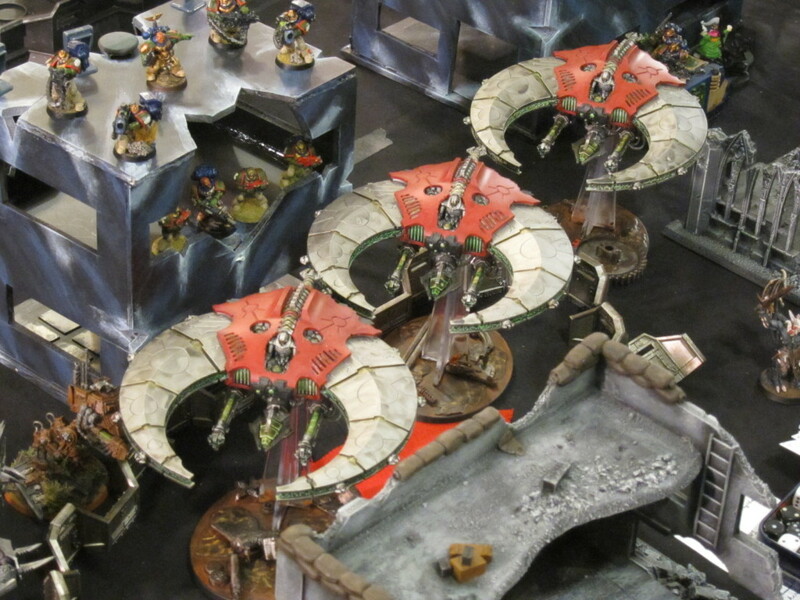 Maynarkh Doom Scythes make a high speed formation strafing run through the occupied city ruins. Midway through the battle, however, the last of Discord’s primary siege works had been finally cracked open. Exposed therein was the treacherous mastermind of the entire campaign: No less than Cypher himself! His position was immediately obliterated beyond all recognition by the Sentinels of Terra and the 59th Armageddon. Presumably nothing could have survived the severe overkill, but the Fallen’s fate is unconfirmed: Deathwing rushing to the site were intercepted en route and unable to gather evidence either way. The Imperial bulwarks on Kimball Prime are lost before the might of The Scythe of Unbound Light and the Manufacturom lost to Chaos, but the instigator of this campaign throwing the sector into disarray is revealed! Both teams claimed 5 superheavy/gargantuan/bulwark and 3 warlord kills, though Order also dispatched the Discord warmaster—Cypher cowardly hiding in a bunker! After Turn 2 Order had a small lead (19 to 15), but Discord gained a slight advantage by Turn 4 (40 to 37), and then Order’s long edge collapsed in Turn 5, yielding a final total score of 65 to 51 in favor of the traitors, heretics, and xenos. A solitary sniper eyes up the battlefield. A few points on the game play itself as well as the design of the match. 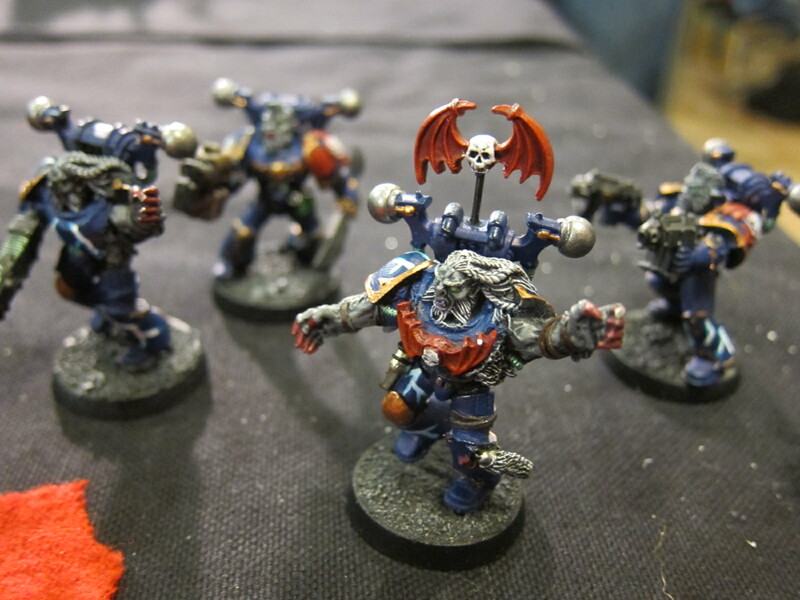 With 120 points up for grabs, the 65-51 Apocalypse outcome certainly wasn’t a blow out. With another turn before scoring the end several of the objectives would have been closely fought, potentially dramatically changing the outcome. The Kingbreakers in particular were setup for 6 turns, and didn’t have time to move back onto the Dormitory objective when the game ended early. By that point though most of the (merely mortal) warlords were ready to pack it in after a long, brutal campaign. We did a reasonable job of keeping things to our schedule, but this was a packed weekend of two long days of gaming. Regardless, in the future we’ll probably score every turn and commanders will have to be prepared for the game to end early in the event that the group starts to flag. 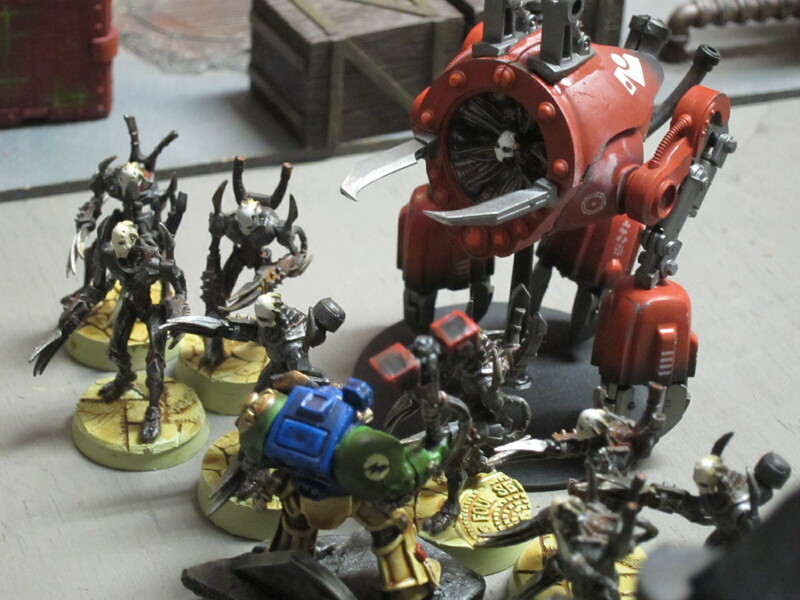 The Mechanicum’s Strongpoint is overwhelmed in a combined tide of living and corrupted metal. Major units, defined as anything with more than 9 hull points/wounds, are “negotiated” between the teams. For this match we agreed not to allow Reavers, though we have in the past, mostly because one in the group isn’t painted and very very few of our players are familiar enough to use them effectively. 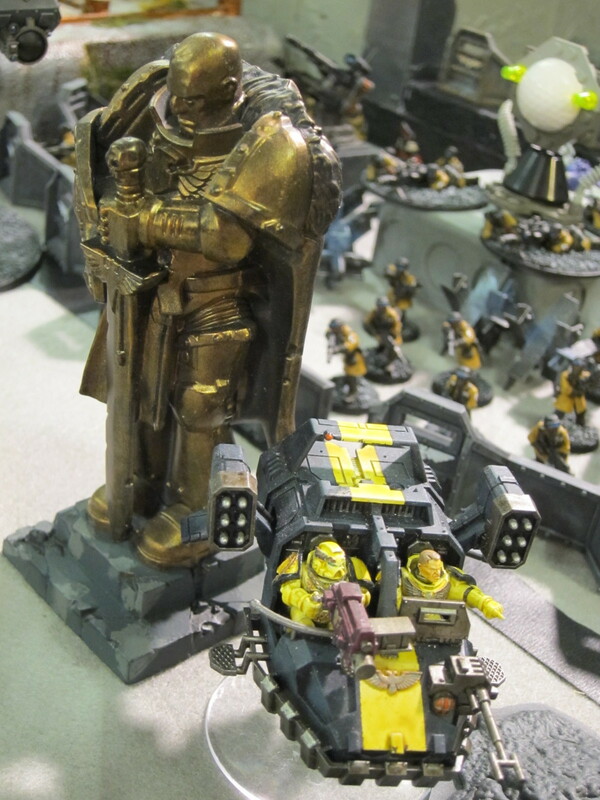 Otherwise everything was allowed and this rule basically just prevents surprises, and enables some shifting around of excess Baneblade-chassis to roughly balance the superheavies across the two teams. Tons of line of sight blocking terrain as well as barricades, rubble, and other smaller terrain providing places for the little guys to hang out. In addition to the board pieces placed pre-game, we ignore the official Apoc rules and leave ruined vehicles in place (as destroyable wreckage) as well as amending the 7th edition core to still replace exploded vehicles with craters, so that infantry have places to hide, particularly after spilling out of a transport. Permitting only Troops to hold the primary objectives in the mid-game scoring obviously makes them critical. Giving all Troops the Objective Secured rule regardless of detachment is also a nice and very relevant buff. A good number of points came down to having Elites vs Troops on the secondary objectives. A full handful of plasmacannon Sentinels lurched about in Order’s backfield waiting for deep striking traitor Terminators to squish. The funky deployment zones used here definitely made things interesting. It’s certainly not uncommon in Apocalypse for a section of the board to get blown away early. This setup though makes the long ends of the L-shapes “obvious” focal points for massive bombardments and attack because they’re exposed on two sides. Despite Discord’s significant siege works, most of their forces on that point were obliterated early on. Probably Order’s Sentinels and 59th Armageddon should have advanced en masse to roll down that flank a bit after it was opened up, but they were harassed enough by deep striking Oblits and Daemons to stay put. In turn, that gave space for the large number of reserves Discord had held back to roll on and just barely mantain that point. On the opposite end, Discord didn’t manage to knockout Order’s Strongpoint at that leading edge for quite some time, but the writing was on the wall with an inexorable wave of enemies working toward it from multiple angles. Order placed a ridiculous amount of forces around the main gate objective for mostly psychological reasons, as well as not wanting to split up commanders’ forces, but we should have allocated some of them down at the opposite end. So, both sides expected the brunt of the fighting to be at those points, but neither adequately realized how true that would be. Encouraging that kind of analysis is a good thing, so I think this deployment setup worked well without being more punishing on any particular player than Apocalypse can be anyway. To that end, this match was actually really strategic. Though definitely not a perfect game, 40k done well is by no means a beer and pretzels affair. That’s surprisingly also true of Apocalypse. With enough attention to terrain, scenario, schedules, and balanced teams, there’s a ton of strategy to be had. 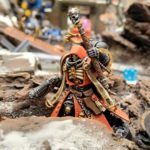 For the most part, Apocalypse doesn’t have the same tactical game that standard 40k does. 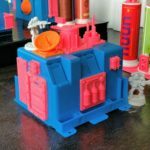 There’s just too much going on, and not enough time to micro-optimize play or avoid all mistakes. I almost certainly removed my warlord on a failed save he didn’t actually fail but was too harried to catch that the power weapon attacking him didn’t defeat his artificier armor. At the same time, I know his unit lived through a turn when they could have gotten crushed because an opposing player was moving too fast trying to get in all of his actions, and accidentally blocked the Discord Warhound from going after them. It was actually jarring going from Recon Squad, which is very tactical, to this monstrosity. 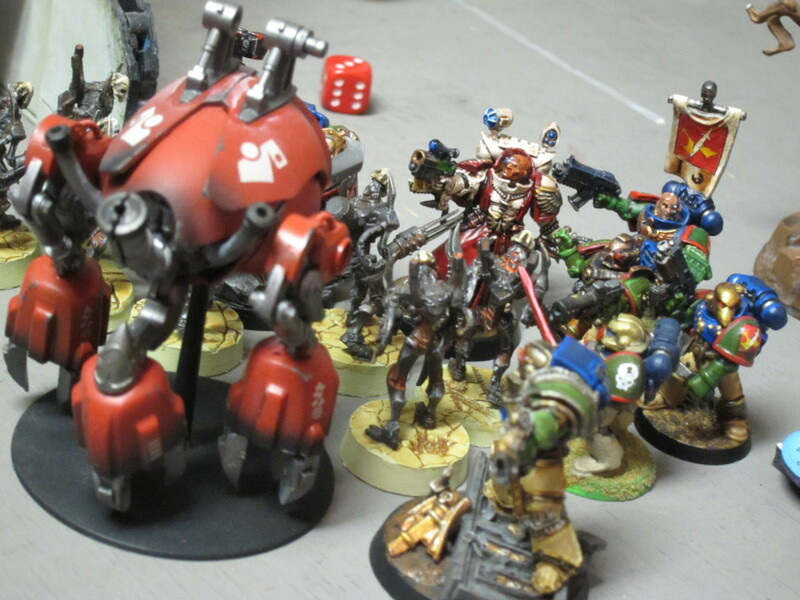 My skirmish Saturday against Colin’s Fallen was extremely chess-like and tight (and awesome! ), whereas Sunday’s chaos was all about the broad strokes, having a well designed list and making the appropriate large scale moves that sailed well above all the really fine grained stuff. A Typhoon heads out on patrol. To a large extent, 40k is a game of resource management and area control rather than micro-maneuvering, and in my eyes is a better game for it. Apocalypse done right takes that to a different level even as it swings on pivotal dice rolls just like any other match. Discord won this game because they kept a large number of units in reserve and combined them well with strategic asset cards to bring them on in the most effective places at just the right times. Ultimately it came down to just a couple Chaos Marines posing a significant threat, combined with a few flyers in position to sweep away the counter-response. Though the gambit looked very promising at the start, Order didn’t have enough oomph left after its initial alpha strike even though it was largely successful. Compounding that, we didn’t wipe out enough of the opposing defenders in the mid-game to prevent Discord from sneaking small groups of reserves into critical positions. Most importantly though, the alpha strike and serious buildup around the main gates left all our troops committed in the wrong places going into the end game, and we just weren’t as able to adapt as the opposing army bringing in new troops all around the board. The Apocalypse somewhere in the early turns. 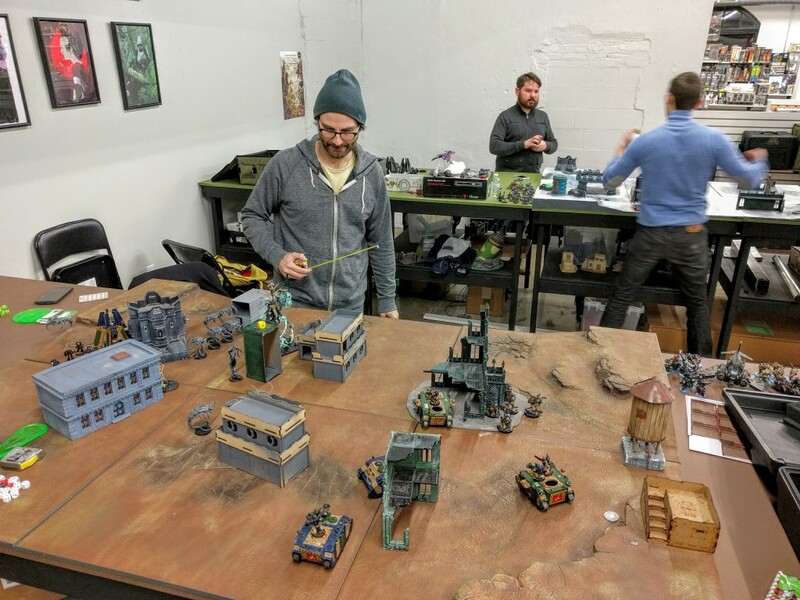 It took a lot of advance work and was a looong weekend, but this was a stellar event encompassing a huge swathe of 40k gaming: Skirmishing, Apocalypse, campaigns, narrative, frantic late night painting, the whole shebang. We’ll also be posting the PDFs driving all of this, and are also considering hosting a larger event around the Philadelphia, Pennsylvania (USA) area sometime in the future. If you are interested in either of those, please sign up for our very low-volume, announcements-only mailing list! Next up is our regular tournament/event at Redcap’s Corner on Saturday, January 24th. Details will be posted to the store’s 40k mailing list and the PAGE Forums shortly, but armies are 1850 points and entry $10. Be there or be forever a traitor enslaved to laughing gods! Captain Angholan subtly motioned for his men to wait as he stepped forward onto the dais. In the complete silence he could hear the soft boom and crunch of the colossal battle going on outside the courtyard. Here though the air was completely still and stale, dead. Ahead stood the motionless monarch, flanked by row after row of his automatons. Eyes locked on his opponent, Angholan swept his softly flaming Vorpal Blade languidly across the arc of the room, then pointed it straight at the Nemesor. Deep in its hollowed eye sockets he thought he could see a slight upbeat in the small lights set there. Then, wordlessly and as one, the ranks of automatons slowly moved forward, enclosing their leader safely behind. The licks of flames at the edge of Angholan’s blade burst to life as First Squad stepped up to join him. It could go down that way too. 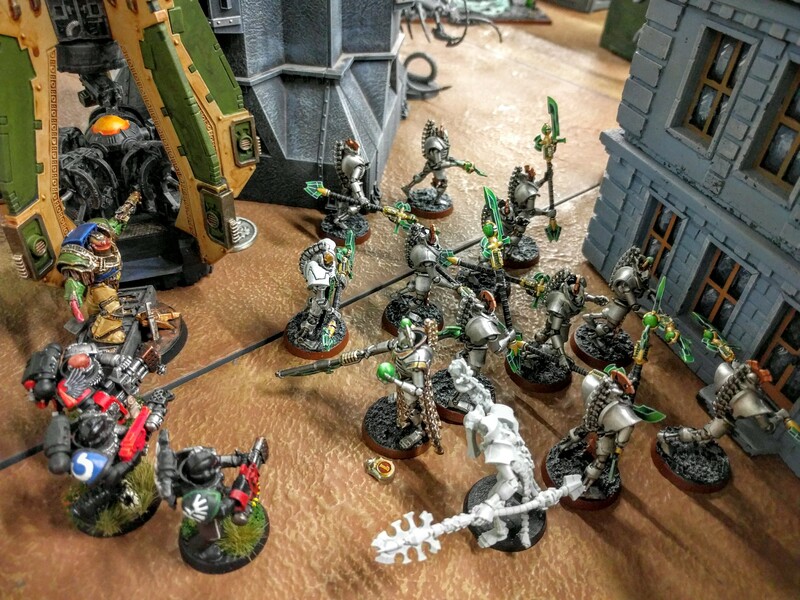 The Kingbreakers’ Captain Angholan and Squad Scolirus fight their way onto the Necron Citadel to challenge Nemesor Zahndrekh personally.